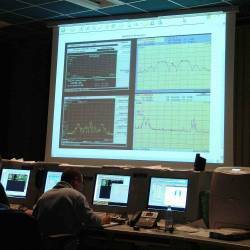 A screen in the Galileo control room displays the spectra of signals received from GIOVE-B shortly after the spacecraft began transmitting navigation signals. ESA photo. 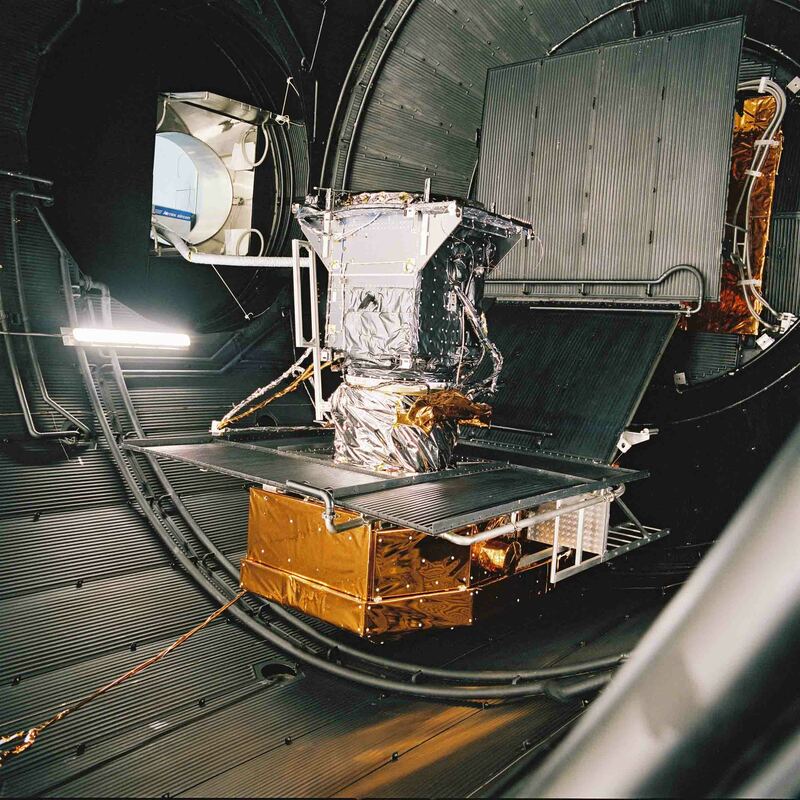 Europe’s second Galileo In-Orbit Validation Element (GIOVE-B) satellite began transmitting navigation signals on May 7, including the common GPS-Galileo civil signal MBOC (multiplexed binary offset carrier). Built under a cooperation between the European Space Agency (ESA) and European Union (EU), GIOVE-B was launched April 27 from the Baikonur cosmodrome in Kazakhstan. The MBOC signal design will be used by the future GPS L1C broadcasts as well as the Galileo Open Service in accordance with an agreement drawn up in July 2007 between the EU and the United States. Locked to an on-board passive hydrogen maser clock, the GIOVE-B signals will help improve positioning accuracy in challenging environments with multipath and interference as well as better penetration for indoor navigation. “Now with GIOVE-B broadcasting its highly accurate signal in space, we have a true representation of what Galileo will offer to provide the most advanced satellite positioning services, while ensuring compatibility and interoperability with GPS,” said ESA’s Galileo project manager, Javier Benedicto. Researchers have already begun tracking the new GIOVE-B signals. Grace Gao, a doctoral candidate in the GPS Laboratory at Stanford University (USA) who helped decode and characterize the Compass MEO signals (described in a July/August 2007 article in Inside GNSS), has decoded the two GIOVE-B codes in the L1 band. She identifies them both as 13-stage Gold codes. Gao has also derived the code generator polynomials. Apparently, the codes that GIOVE-B are transmitting are different from the ones in the Galileo Interface Control Document (ICD). The broadcast codes are Gold codes, not memory codes. 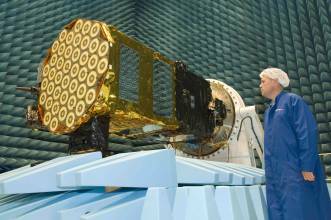 (The Galileo ICD is available on the European GNSS Supervisory Authority (GSA) website. The GSA is inviting feedback on the ICD until June 6. A comment form is available on the GSA website.) An article by Gao and colleagues describing their work will appear in the May/June 2008 issue of Inside GNSS. According to engineers at Belgian GNSS receiver manufacturer Septentrio, the characteristic MBOC correlation peak as measured by Septentrio’s GeNeRx (see photo) from the live GIOVE-B signal perfectly agrees with expectations: the MBOC correlation exhibits a significantly narrower peak than the traditional BOC peak. The GeNeRx receiver started tracking the first MBOC signals in space on May 7, the day the satellite began broadcasting an MBOC modulation (more exactly the complex BOC or CBOC variant of it). The quality of the signals is now being analyzed by several facilities, including the GIOVE-B Control Centre at Telespazio’s facilities in Fucino, Italy, the Galileo Processing Centre at ESA’s European Space Research and Technology Centre (ESTEC), in the Netherlands, the ESA ground station at Redu, Belgium, and the Rutherford Appleton Laboratory (RAL) Chilbolton Observatory in the United Kingdom. According to ESA, Galileo teams within ESA and industry have the means to observe and record the spectrum of the signals transmitted by GIOVE-B in real time. Several measurements are performed relating to transmitted signal power, center frequency and bandwidth, as well as the format of the navigation signals generated on board. This allows the analysis of the satellite transmissions in the three frequency bands reserved for it. Chilbolton’s 25-meter antenna enables researchers to analyze the characteristics of GIOVE-B signals with great accuracy and verify that they conform to the Galileo system’s design specification. Whenever the satellite is visible from Redu and Chilbolton, the large antennas are activated and track the satellite. GIOVE-B is orbiting at an altitude of 23,173 kilometers, making a complete journey around the Earth every 14 hours and 3 minutes.